Formed by Italian bass player and composer Matteo Bortone in 2008, TRAVELERS is a french/Italian quartet embracing sonic adventures trying to explore the edge between contemporary jazz and rock/pop music. This musical intention is created by bridging a weaving world of contrasts and dialogues between heady melodies, sweet songs and full-on improvisations where electric and acoustic interwine. Travelers sound concept is determined by the composition and instrumentation but also by the belief and the will to be a group with the same line-up, a band with- out prima dona where the artistry and personality of the musicians are revealed throughout Bortone’s repertoire, tailor-made for his companions. 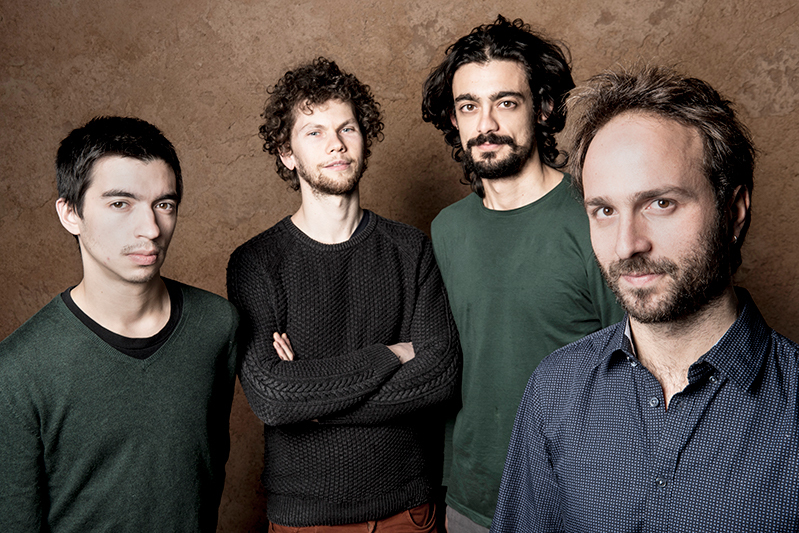 The young group unites four of the most outstanding musicians of the new jazz generation: together with Matteo, Antonin-Tri Hoang (alto sax, clarinets), Francesco Diodati (guitar, effects) and Ariel Tessier (drums).